My mother-in-law made some chinese roast pork when we were in Kuching for the Chinese New Year. Chinese roast pork here refers to siew yuk (in cantonese) or sio bak (in hokkien). With a crispy crackling roasted skin and semi-tender meat, you can be assured of spoonfuls after spoonfuls of rice to go with it. No wonder I put on weight over Chinese New Year! In Malaysia, there are many roast pork rice stalls around. It is very popular. A plate of white / fragrant rice with a few cuts of these roast pork and a couple of pieces of sliced cucumbers can cost about USD1.00 on the average depending where you go to. Very cheap, right? Absolutely. This is my mother-in-law’s recipe for Chinese Roast Pork and the measurements are approximate only because she cooks it more by feel than using a strict recipe to follow. Clean pork belly and pat dry with kitchen towel. Rub fine salt and five-spice powder on meat. Rub coarse salt on skin. Heat up oven at gas mark 4 (about 180 degrees celcius). Place pork belly on a rack with a tray underneath to catch dripping oil. 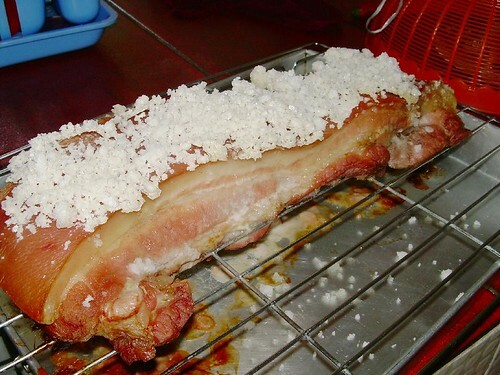 Roast the pork belly for at least 30 minutes and until the coarse salt crystalises just like in the picture above. 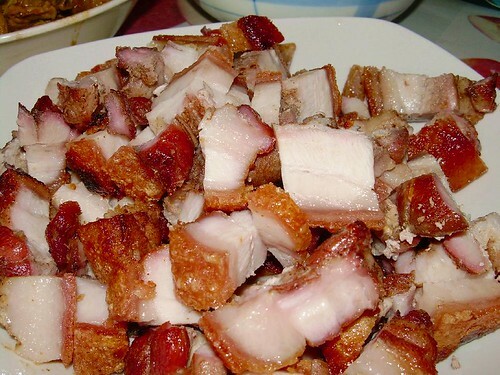 I have heard of some of the chinese roast pork recipe which called for the pork belly skin to be poked with a sharp knife so as to enable the fat to ooze out faster during roasting. You can try this additional step as well prior to rubbing the coarse salt. Cut into small bite sizes prior to serving. 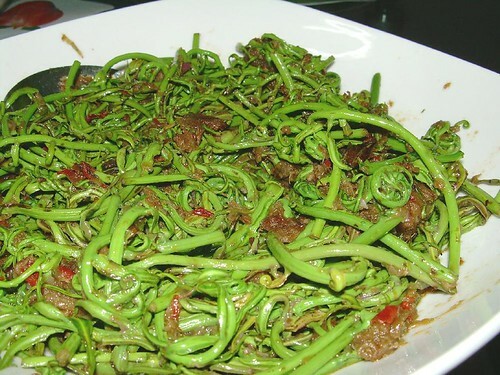 Fancy a dish of paku miding or miding fern? I tell you, it is absolutely delicious! So far, I have not encountered it in the markets in Kuala Lumpur but it is available in Kuching, Sarawak. If you were to ask me to choose between Belacan Kangkong and Belacan Miding, I will go for the latter anytime. 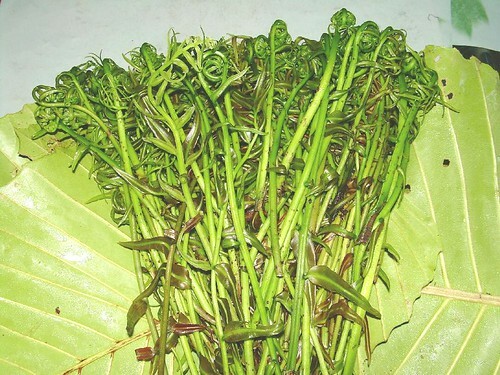 The fern is very crunchy to the bite and tastes wonderful with belacan (shrimp paste). Miding is quite expensive nowadays. The small bunch above costs RM2.00 per bunch but that is not all. Only the tip of the fern is used in cooking and the rests and discarded due to its tough fibrous feel. On the other hand, the tip is tender yet crunchy to the bite. Back in the years when I used to stay in Kuching, I’ve seen some women gathering the miding fern from thick bushes along the road side. It is no mean feat as much needs to be gathered. 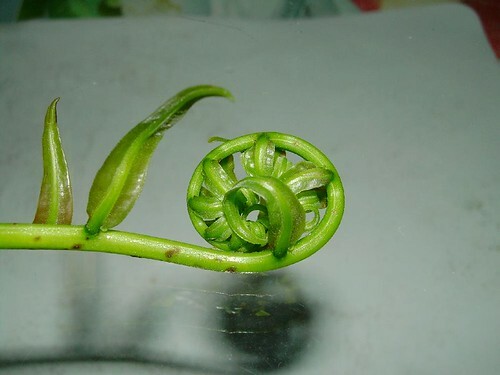 The tip of the fern will wilt during cooking and thus, the volume of the dish will decrease. I suppose many people like this dish because it is probably pesticide free. Nature’s good stuff! Pound or blend belacan, garlic, shallots, dried prawns and red chillies. Heat 2 tablespoons oil in wok and saute belacan mix till aromatic (approximately 1 minute). Add another tablespoon of oil if belacan mix too dry or begin to burn. Add miding to belacan mix and stir-fry briskly. Add water and continue stir frying till water almost dried up (but miding is moist). Dish up and serve with steamed white rice. I am quite fond of celeries. 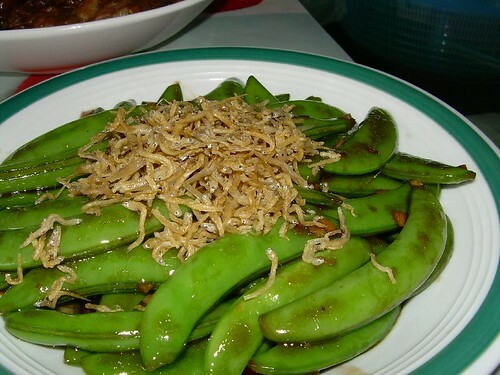 This vegetable is highly fibrous and good for health. When made into celery juice, it does reduce the bad cholesterol of some patients. But I don’t really like celery juice because it tastes rather funny. Saltish, I would say. 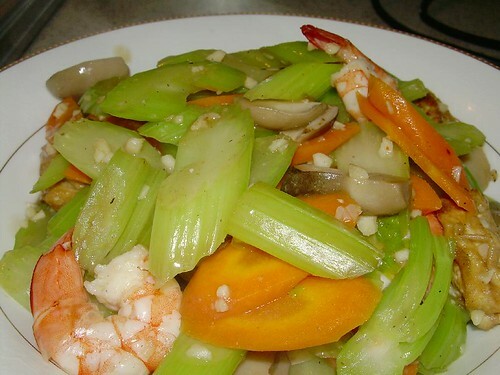 Most of the time, I would just stir fry the celery with carrots, mushrooms and prawns. I really did not intend to cook the straw mushrooms on this occasion. That morning, i bought a can of straw mushrooms only to drop it whilst driving and thus causing a dent on the can. Since the can is dented, I cannot be keeping the can of straw mushrooms longer for fear of possible leaching of iron (I am still struggling to understand this bit). Anyway, the dish turned out well and we truly had an enjoyable meal. The crunchiness of the celery and carrots were balanced by the smoothness of the mushrooms. The prawns lended its sweetness to the dish. Voila! Heat oil in wok and saute garlic till beginning to brown. Add prawns and stir for 15 seconds. Remove prawns and set aside. Add celery, carrots and straw mushrooms into the wok and continue stir frying for 1 minute. Add seasoning and water and bring to boil. Return prawns into the rest of the ingredients. Cook for another 2 minutes and add corn starch to thicken gravy (if necessary).